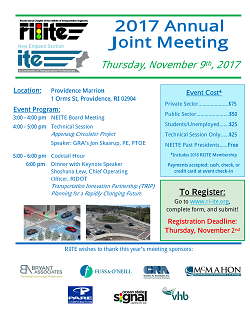 Join RIITE and NEITE for their annual joint meeting at the Providence Marriott Hotel on November 9 starting at 4:00pm. The Meeting will include a Technical Session on the Apponaug Circular Project by Jon Skaarup, Cocktail hour and Dinner with Keynote Speaker COO of RIDOT Shoshana Lew. For more information, click HERE. To register, click HERE.